Jesse Hagopian teaches Ethnic Studies and is the co-adviser to the Black Student Union at Garfield High School–the site of the historic boycott of the MAP test in 2013. Jesse is an editor for the social justice periodical Rethinking Schools, is the co-editor of the new book, Teaching for Black Lives, and is the editor of the book, More Than a Score: The New Uprising Against High-Stakes Testing. Jesse serves as the Director of the Black Education Matters Student Activist Award. In addition to education, Jesse organizes with NFL pro bowler Michael Bennett and other professional athletes who protest injustice. Jesse joined the organizing team of Athletes for Impact, a group that is dedicated to bringing together athletes in struggles for social justice. Jesse is founding member of Social Equity Educators (SEE), a recipient of the 2012 Abe Keller Foundation award for “excellence and innovation in peace education,” and won the 2013 “Secondary School Teacher of the Year” award and the Special Achievement “Courageous Leadership” award from the Academy of Education Arts and Sciences. In 2015, Jesse received the Seattle/King County NAACP Service Award, was named as an Education Fellow to The Progressive magazine, as well as a “Cultural Freedom Fellow” for the Lannan Foundation for his nationally recognized work in promoting critical thinking and opposing high-stakes testing. Jesse is an activist, public speaker, and a contributing author to 101 Changemakers: Rebels and Radicals Who Changed US History, Education and Capitalism: Struggles for Learning and Liberation (Haymarket Books), and Why We Teach Now (Edited by Sonia Nieto, Teachers College Press). Jesse’s essay on the MAP test boycott and the ensuing national uprising against high-stakes testing was published in Howard Zinn and Anthony Arnove’s 10th anniversary edition of Voices of a People’s History of the United States. Jesse’s commentary has been featured on many local and national news programs including, NBC’s “Education Nation,” The PBS News Hour with Gwen Ifill, CNN, Keith Olberman’s Countdown, The Dan Rather Report, Democracy Now!, The Real News Network, Busted Pencils, The Laura Flanders Show, and C-Span’s “Book TV.” Jesse’s writings on education, the Black Lives Matter movement, Haiti, Palestine, and U.S. politics, have been published at Salon.com, Truth Out, Common Dreams, Black Agenda Report, The Progressive, Socialist Worker, Alternet, the Seattle Education website, and the National Education Association’s Education Votes blog. He has also been a frequent special guest contributor to the Seattle Times op-ed page. In January, 2013, Jesse helped organize the MAP test boycott that began at Garfield High School, quickly spread to several other Seattle Schools, and helped ignite a national movement against the abuses of standardized testing. In 2012, Jesse attempted a citizen’s arrest of the Washington State Legislature when they announced cuts of some $2 billion from health and education, as the decision violated the State Constitution and subsequent law mandating a fully funded education system. 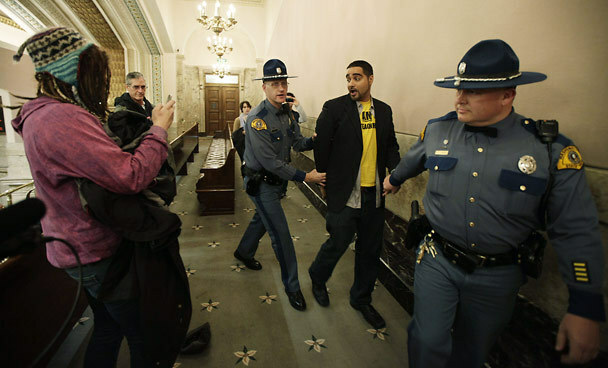 When Jesse and a group of Social Equality Educators finished reading the charges to a stunned state legislature, Jesse produced a pair of plastic handcuffs and encouraged the legislators to turn themselves in. It was Jesse, however, who left in cuffs and spent the evening in jail. Upon hearing of his arrest, the students at Garfield staged a mass walkout against budget cuts to education that made national headlines. In 2011, Jesse participated in the Interfaith Peace Builder’s historic first African Heritage delegation that brought 14 African Americans ages 28-70 years old to Israel and Palestine to meet with civil society organizations, human rights groups, and grassroots activists to better understand the conflict. In 2010, Jesse and his family were in Haiti when the devastating earthquake hit and joined the relief effort in the aftermath. Upon his return home to Seattle, Jesse joined the board of directors of Maha-Lilo—“Many Hands, Light Load”—a Haiti solidarity organization. Jesse is a graduate of Seattle’s Garfield High School and Macalester College, and obtained his Master’s degree in teaching at the University of Washington. Jesse and his wife are the proud parents of two young boys. Jesse can be reached at: jesse@rethinkingschools.org and you can follow him on Twitter.